Compact, lightweight tripod for smartphones and digital cameras. Thanks to the flexibly adjustable, bendable legs, the tripod can also be adjusted to uneven floors and wrapped around poles or branches. The rubber coating on the tripod feet ensures stability everywhere. The integrated ball head is easy to use and secured by a double-lock system. The small quick release plate can easily be fixed with a coin on any camera screw with a 1/4" thread. 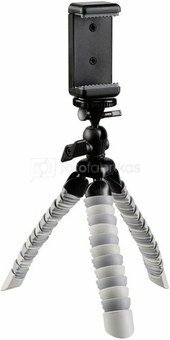 You can also use the tripod as a monopod for easy video recordings. The practical clamp holder supplied with the tripod ensures safe fastening of a smartphone. The two threaded holes in the mounting allow taking pictures or recording movies both in portrait and in landscape mode.